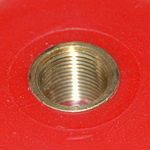 The tank is fitted with a 50mm straight inlet. This is used to attach a 50mm hose. This brass inserts is molded into the tank. This is commonly used for the screw in elecronic sender.